One final note on the Catholic Homeschoolers of Georgia conference, which I had the honor of attending yesterday: On my website, I say that in the workshop, “teaching points arise organically.” Here is one good example of what that means. 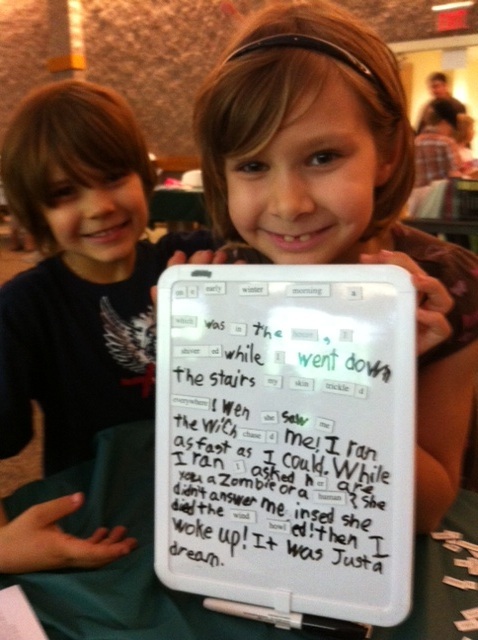 A group of five delightful siblings convened around my table, and we had a blast working on this poem together. 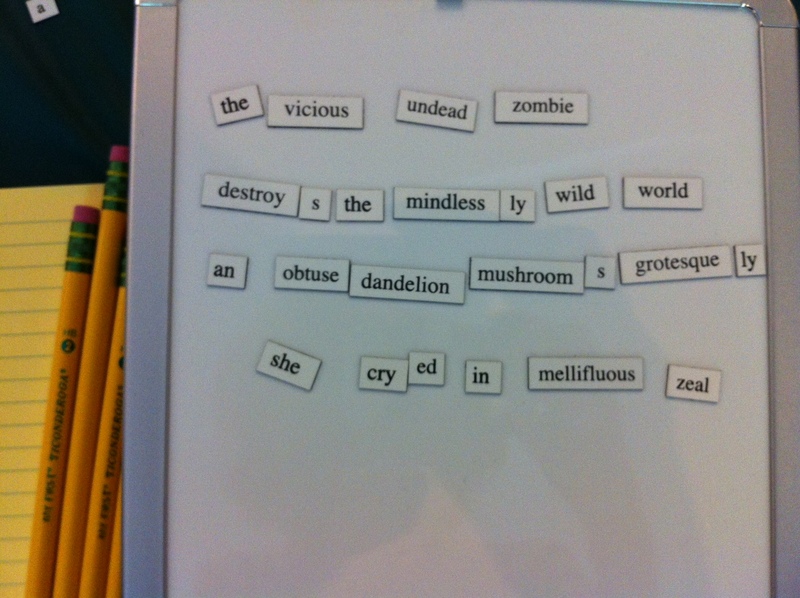 We were trying out all kinds of combinations, when one of the children, Tom, put together the combination “mindlessly wild world” and said it aloud. All six of our faces lit up, and we all smiled and said, “Yeah!” So, there was the teaching point. THAT, I said, is poetry, and look: It came naturally once they started working with the words. In a typical writing class, students might study the concepts first, reading famous poems that demonstrate them, and then attempt to apply the concepts by writing verse. There’s nothing wrong with that. It is one way to learn. But in a workshop, these things often happen naturally, and when you discover what it is that you did that made your writing “work” or “click,” there is something extremely satisfying about that. 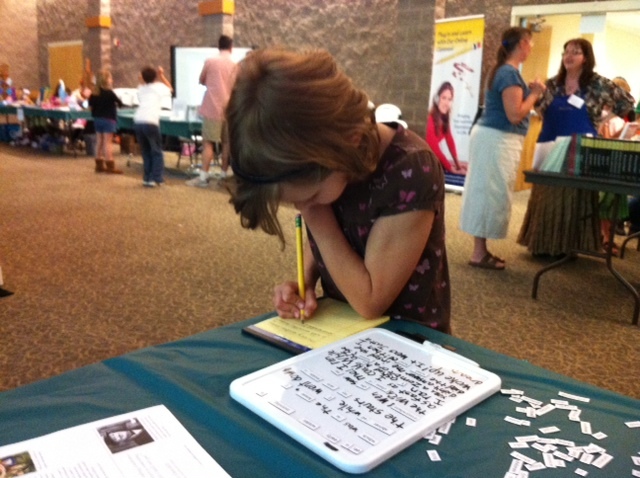 I met another young writer at the Catholic Homeschoolers of Georgia Conference: Selah, age 9. Selah was hard at work for over 30 minutes composing a fictional narrative. 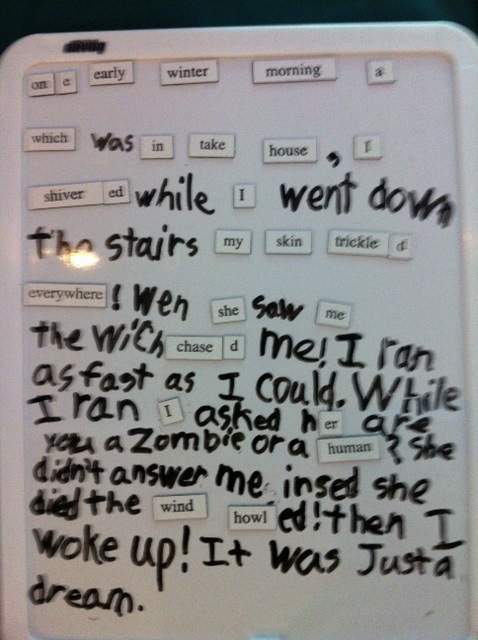 The magnetic poetry didn’t provide her with all the words she needed, so she started using the marker. Very resourceful! When her family said it was time to go home, Selah said, “But I can’t. I need to finish my story.” (The mark of a true artist!) Her family kindly obliged while she added those finishing touches. In the end, it was something she could be proud of. Here it is if you’d like to read her story. 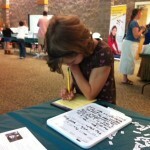 By the way, I was wondering where she got her writing chops, until her mom told me about her blog: Use Your Momstinct. It’s pretty cool. You should check it out! I had so much fun at the Catholic Homeschoolers of Georgia Conference yesterday. It was a real treat for me to be able to talk with some homeschoolers face-to-face. As an online writing coach, I don’t often get that opportunity. 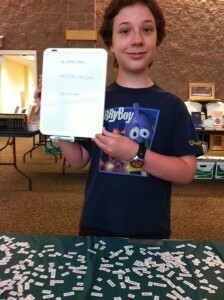 I was very impressed with a few young writers who stopped by my table to compose “magnetic poetry.” Meet David, age 13. 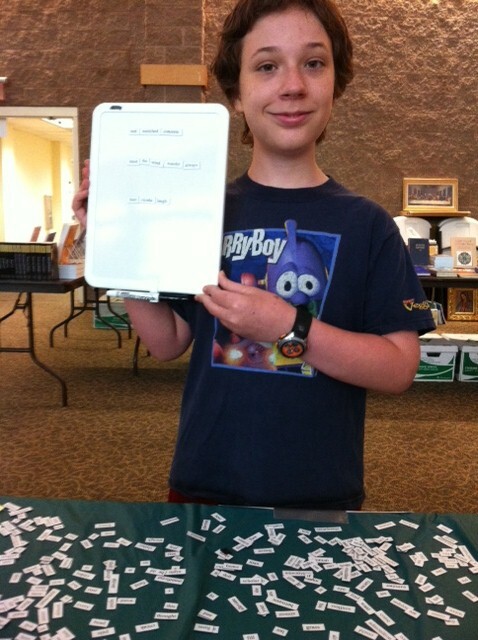 David loves long words, adjectives, and word play. must the wind always wander? 1. The prefix “un” looks the same if you flip it upside down. 4. The heart of a tree and the tail of a dog have something in common: They are both farthest from the bark!